Intel vPro is Intel’s application of Active Management Technology. Intel vPro gives IT administrators the ability to manage their systems via a built-in hardware device. 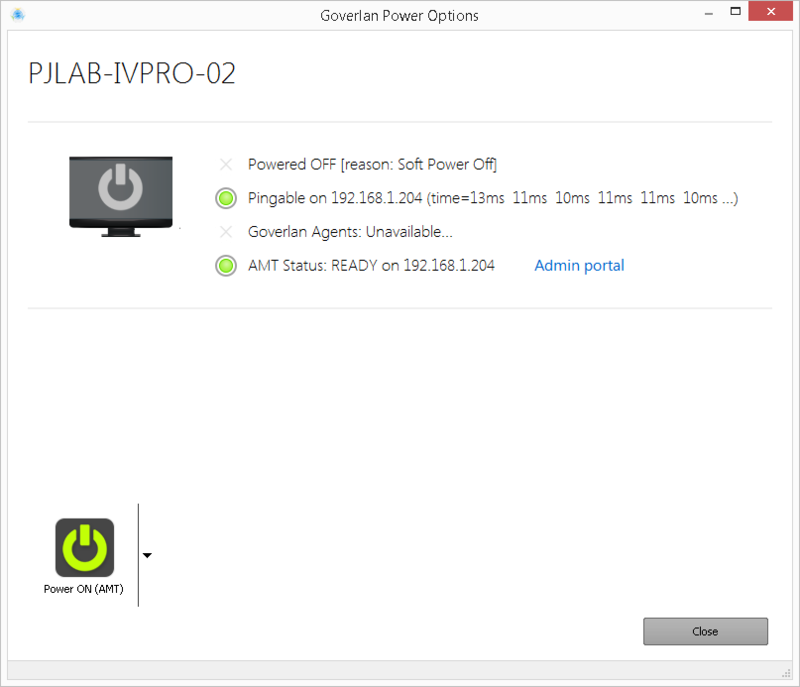 The Goverlan Reach remote access software gives you access to Intel vPro features in an intuitive and easy to understand format. Your Intel vPro system must be provisioned and configured before you can access the features. Please consult your hardware vendor’s technical guides for details. Intel vPro has many different configuration options. Goverlan is designed to automatically detect different configurations and apply settings accordingly. Client Control Mode: Client Control Mode refers to vPro systems that have been configured by the local MEBx software directly. When a system has been provisioned in Client Control Mode, all KVM functionality will require user acceptance. Admin Control Mode: Admin Control Mode refers to vPro systems that have been configured by an Intel SCS server or third party provisioning server. Intel vPro systems require authentication before a feature can be accessed. 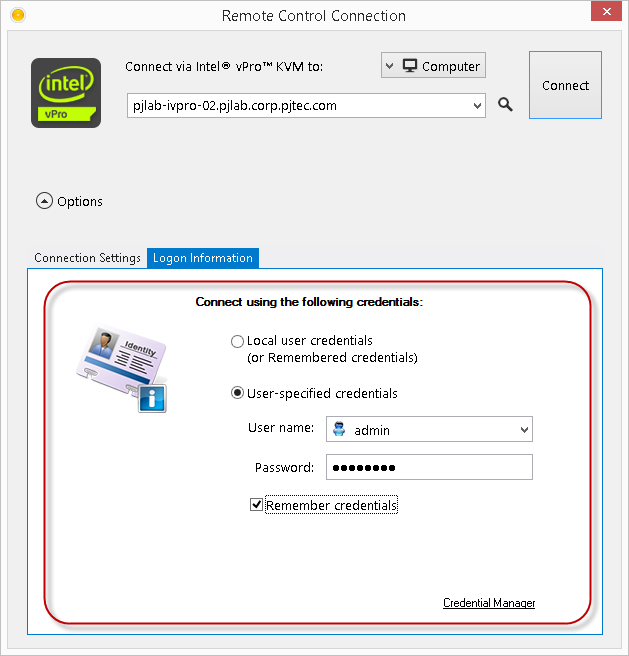 Use the Goverlan Credential Manager for seamless authentication to the Intel vPro chip. For more information, see Using Alternate Credentials in Goverlan. Custom ACLs: Custom Access Control Lists can be configured directly in the MEBx or by a provisioning server. Add your custom user account to the Goverlan Credential Manager for seamless access to Intel vPro features. Active Directory Integrated: Intel vPro supports Kerberos Authentication for accessing features. Goverlan automatically detects this configuration and will attempt to use the Goverlan operators Active Directory Credentials. Alternate Credentials can be added to the Credential Manager if necessary. To use Active Directory/Kerberos authentication, you must specify the fully qualified domain name of the target system. Intel vPro can be configured to require TLS before allowing any connection. Goverlan will automatically detect if the Intel vPro system is using TLS. Intel vPro systems use TCP 16994 for KVM connections to a system. 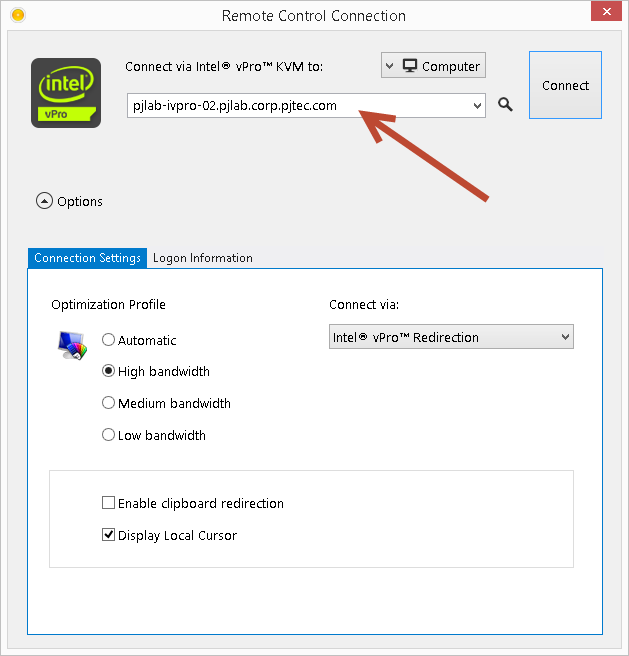 Intel vPro can also use the standard VNC port for KVM connections. TLS and Kerberos/Active Directory Authentication are not available with the standard VNC port. Goverlan Reach RC can now harness to power of the Intel vPro out-of-band KVM. Intel vPro KVM features allows out-of-band KVM access to any Intel vPro enabled workstation. Be sure to read Configuring Goverlan for Intel vPro for all of the Intel vPro considerations. Use the More Options button or the arrow below the Connect button in the Command Bar and select via Intel vPro KVM. If your Intel vPro systems are configured to use TLS or Kerberos/Active Directory authentication, enter the fully qualified domain name (FQDN). For more information about authentication modes, see Configuring Goverlan for Intel vPro. Intel vPro can be configured to use the standard VNC port (5900) or the Intel vPro redirected ports. For more information about Intel vPro Redirection, see Configuring Goverlan for Intel vPro. Use the Logon Information Tab to specify alternate Active Directory credentials or Intel vPro ACL credentials. User Acceptance is controlled by the Intel vPro chip or from a policy from the provisioning server. Intel vPro requires user acceptance if the system is configured in Client Control Mode. For more information about provisioning modes, see Configuring Goverlan for Intel vPro. Intel vPro is a hardware specification and must be purchased. Please consult your hardware vendor for more information. 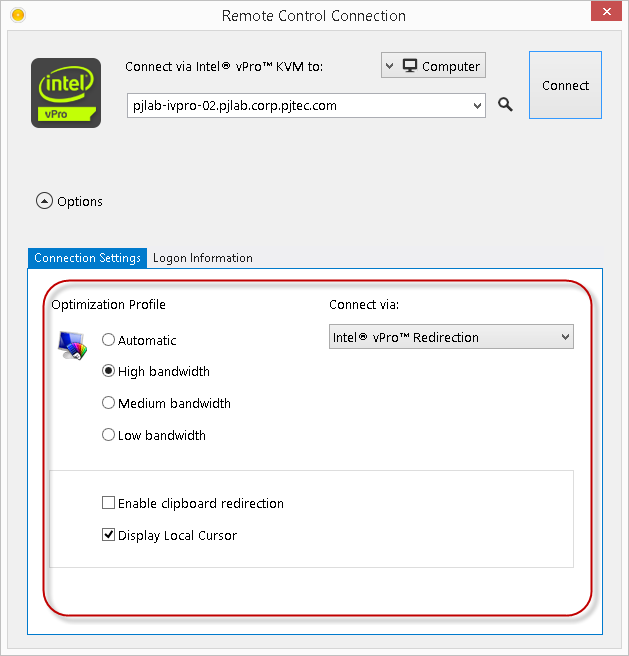 Video – Intel vPro KVM features. Use Goverlan Reach RC control the out of band power state of any vPro enabled desktop. 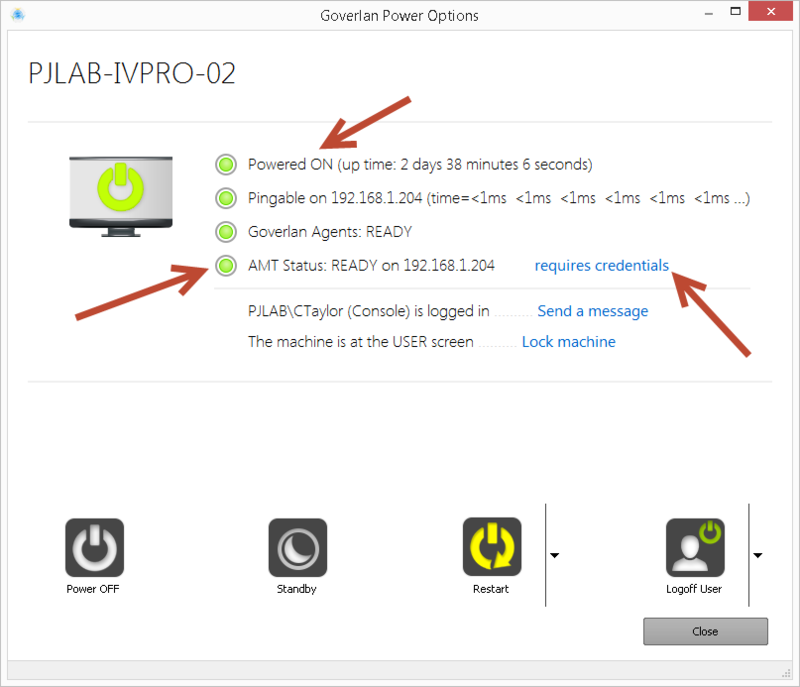 For more information about Intel vPro and Goverlan, see Configuring Goverlan for Intel vPro. The features shown here are for specific Intel vPro options. For more information about the Power Options Dashboard, see Power Options. 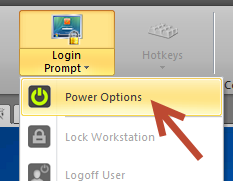 You can find the Power Options Dashboard for any workstation in the following locations. Right click any Windows system in the My Devices Panel and select Power Options. The Power Options Dashboard has many features for Intel vPro enabled systems. The Powered On monitor will retrieve the power status directly from the Intel vPro chip. Goverlan will query the status of the AMT chip and inform you if Intel vPro credentials are required. 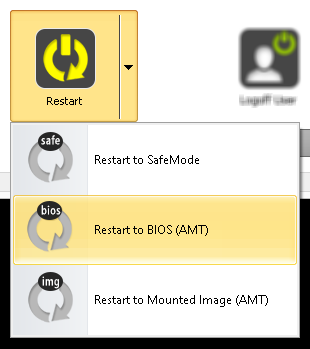 Use the Restart Menu to Restart an Intel vPro enabled system to the BIOS. Use the Restart Menu to restart an Intel vPro enabled system to a specified ISO Image. 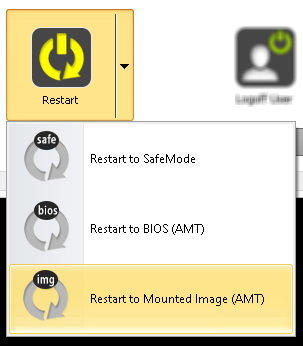 Choose the ISO image location and select “Then restart the host to the Mounted Image” and click Execute. Use the Power Options Dashboard screen to power up an Intel vPro system that is completely off. If the system is completely powered down but the Intel vPro chip is available, use the Power On (AMT) button to turn this system on. This is not a Wake on Lan operation. For more information on Wake on Lan see, Power Options. Video – Intel vPro Power features. Intel vPro is a hardware specification and must be purchased. Please consult your hardware vendor. Goverlan Reach RC allows you to reboot any Intel vPro enabled workstation to an ISO image for any management purposes. This is a very powerful feature and has many uses. For more information about Intel vPro and Goverlan, see Configuring Goverlan for Intel vPro. 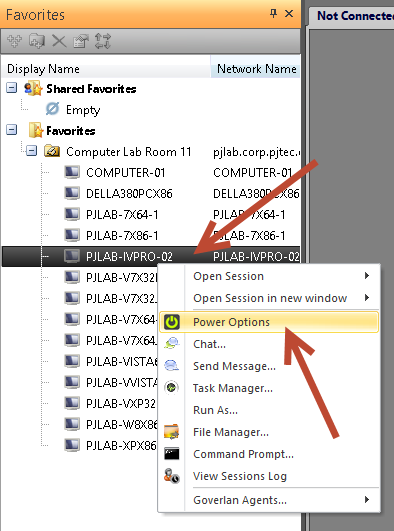 Open the Power Options Dashboard. For more information, see Power Options. Video – Intel vPro ISO Mounting features.